This exceptional George V English sterling silver teapot has a baluster shaped form. The surface of this English silver teapot is plain and embellished with an impressive band of applied cut card stylised leaf decoration to the upper portion. This antique teapot is fitted with a plain hinged hallmarked cover, ornamented to the domed upper portion with a fine and impressive applied cut card leaf decorated design encircling the original circular rounded, gadroon decorated baluster shaped, cast sterling silver finial. The rim of cover and foot are encircled with impressive applied gadroon decorated borders. This teapot is fitted with the original C shaped, carved painted wood handle with plain sterling silver sockets. The plain swan necked spout is ornamented with further applied cut card leaf decoration to the lip. 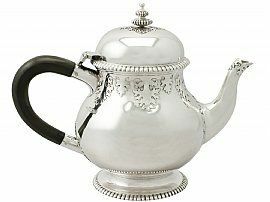 This antique English silver teapot is an exceptional gauge of silver, exceptional quality and in exceptional condition. Full hallmarks struck to the surface of the teapot have wear in keeping with age and location. The part hallmarks to the rim of the cover are all very clear.